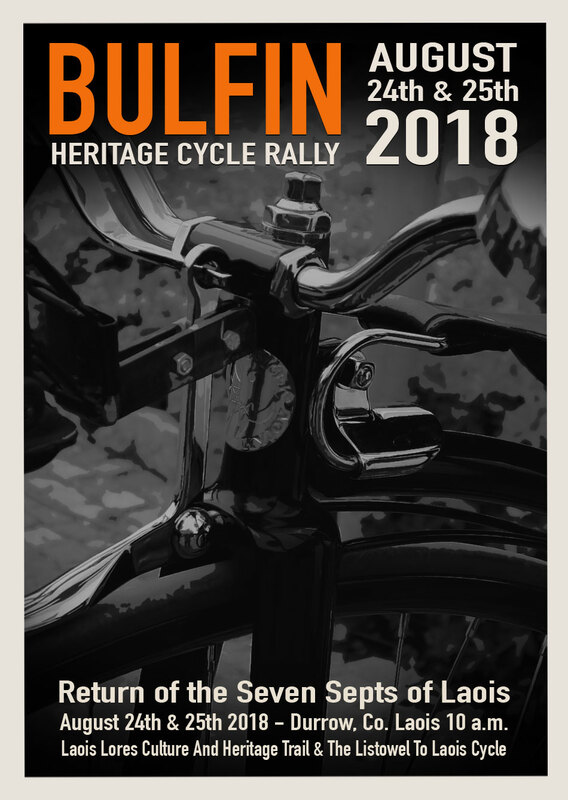 The Bulfin Heritage Cycle Rally. The Inspiration behind the event. William Bulfin was a journalist, travel writer and proud Irish Nationalist, who was born in Derkrinlough, Co. Offaly in 1864. Having returned from Argentina in 1902, (after working there on the pampas amongst the native gaucho tribe), he set off on a journey that took him through the highways and byways of Ireland, on a steel framed bicycle made by Pierce of Wexford. ‘Rambles In Eirinn’ is the insightful book written by William Bulfin, about that cycling experience, and each captivating page tells a story of Ireland’s ancient past. The travelogue was published in 1907 and proved to be a resounding success, extending to a fourth edition, published in 1915. Having visited heritage sites of interest in Offaly, Laois, Kilkenny and Tipperary over the past four years, our event in 2018 will focus in its entirety on the rich heritage of County Laois, with a view to creating a lasting experience of the living culture and hidden heritage of our county. The event will include community and visitor engagement through promenade theatre style sketches, re-enactments, storytelling and traditional music. 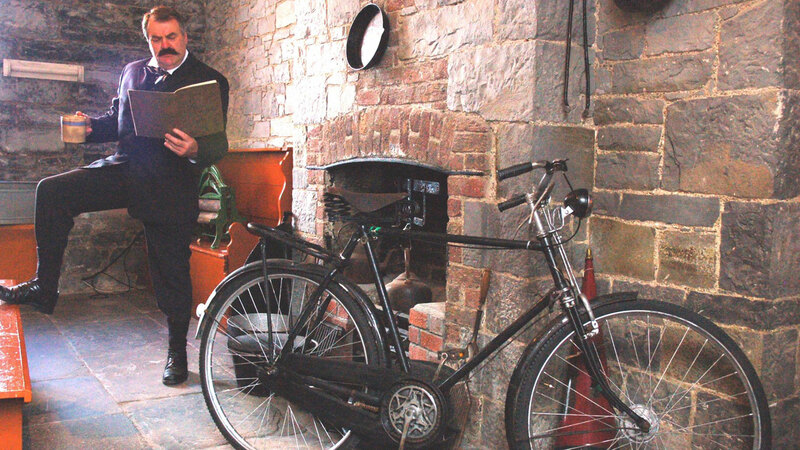 “William Bulfin” checking his notes … “warming” his High Nelly and indulging in a cup of strong brew before his departure for the Derrinlough to Durrow High Nelly Heritage Cycle on Saturday 29th & Sunday 30th August as part of the National Heritage Week series of events. The revised route map for the Derrinlough to Durrow High Nelly Heritage Cycle on August 29th & 30th 2015. Ireland’s first ever “Bulfin Bike Route”. Her Excellency the Argentine Ambassador to Ireland, Ms Silvia Merega and Mary Bulfin, (great grandaughter of William Bulfin) admiring William Bulfin’s book “Rambles in Eirinn” (1907) at the official launch of the Derrinlough to Durrow High Nelly Heritage Cycle at the Rock of Dunamaise Heritage site. Also pictured are, Bob Campion, Durrow High Nelly Club, Noel Mooney, Organising committee, Hugh Sheppard, Organising committee and Mary Doyle, Durrow High Nelly Club. Noel Mooney, Hugh Sheppard and Matt Doyle …The cycle was only part of the fun! representing the Seven Laois Septs, will return to Laois, to light up a Ceremonial Laois Sept Vessel, at a special Heritage gathering at the Rock of Dunamase in Laois. “Laois Lores”, Culture & Heritage Trail with “William Bulfin” and a boyhood “Owney McRory O’More”. “I am Owney McRory O’More” introduction to Laois Sept, O’More Family. Heritage talk – O’ More Family History. The round tower of Timahoe was built sometime in the 1100s, on the site of a religious community founded by Saint Mochua (a 7th-century warrior who converted to Christianity) around 600 AD. The tower rises almost 30 metres high and is more than 17 metres wide at its base, with walls that are nearly two metres thick. Inside there are five different floors, all of which were reached by ladders. Buy Day One or Full Event Tickets here! Breakfast Heritage Talk, “The Battle of Mullaghmast” with “William Bulfin”. Medieval Chariot Ride/High Nelly Cycle to Emo Court for 11.15am. (Guided tour of Emo Court & Gardens). Medieval Chariot Ride/High Nelly Cycle to Ballyroan. 2.45pm: Ballyroan: “Pass of the Plumes” 1599 battle re-enactment at Rockview Walkways & Resource Centre. “Owney McRory O’More soldiers” intercept “Earl of Essex soldiers” in period outfits of Plumaged/Feathered head dress). Heritage talk with Willie McGrath. Irish & Austrian Traditional/Folk Music and Dance. (Light refreshments served). 5pm: Alyward’s Rural Heritage Museum; viewing of artefacts. 6pm: Durrow: Ashbrook Arms: Bulfin Heritage Cycle Rally 2018 Finale; Event Celebratory Meal. Followed by: Music, Entertainment/Sing-Song at Bob’s Bar with Irish & Austrian musicians. Please note: Ticket price covers all of the above mentioned items! Buy Day Two or Full Event Tickets here!